User Arun Pyasi shows us how to set up a FreeBSD 11 web server with Nginx, MySQL, and PHP. Follow the link below for the full set of instructions. We have been running LEMP stack ie Nginx, MySQL and PHP in Linux based operating system but today we’ll be installing FEMP stack on FreeBSD 11. FreeBSD is a free and open source Unix-like operating system based on BSD systems. Unlike Linux, FreeBSD is developed and maintained as an entire operating system from kernel, device drivers to the userland utilities whereas linux is a kernel with device drivers. Nginx is a free and open source web server which is known widely for its speed and ability of load balancing and caching. It is one of the most popular web server and proxy server used in large numbers of servers. MySQL is an open source relational database management system which is developed and maintained by Oracle whereas its free and open source version ie MariaDB is also available on the internet. PHP is a server-side scripting language which is written for web development as a backend language which is developed and maintained by Zend Technologies. 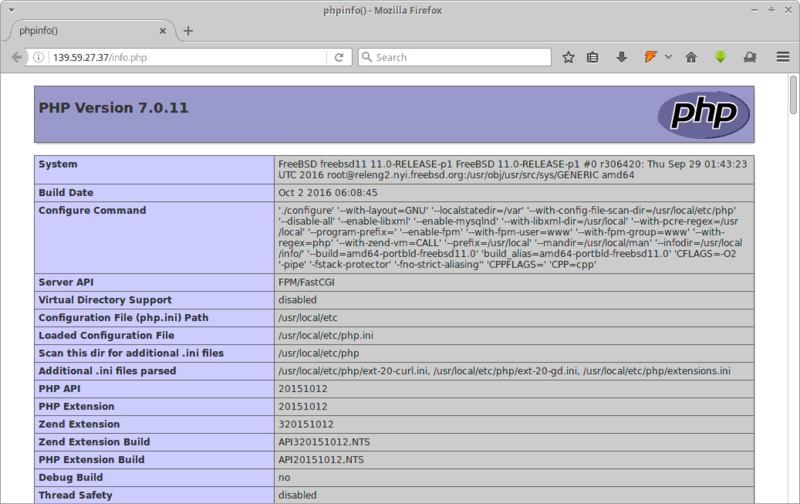 And the combination of Nginx, MySQL and PHP running in FreeBSD 11 is known as FEMP stack. First of all, we’ll gonna update our FreeBSD 11 operating system to the latest packages available on the repositories. As the default package manager of FreeBSD 11 is pkg, we’ll run the following pkg command to update our system using sudo privilege.